I worked with Emily from One Lovely Life today to bring you a really fun ingredient spotlight on pumpkin. Since chances are good you’ll be downing a piece or two of pumpkin pie this weekend, you might as well know a little bit about them! And if you happen to remember a few of the facts and bust them out at the dinner table you might just impress your great Aunt Sue. Who doesn’t love some good trivia?! I know I’m a sucker for it. Pumpkin is a member of the same family as squash. I mentioned this with summer squash, but squash, along with corn (maize) and beans are part of the Native American “three sisters” that kept the early settlers alive. They have a symbiotic relationship and help each other grow. They also work together to form complete proteins. Pumpkins are one of the oldest cultivated plants in this country–even older than corn (maize). They now grow on every continent but Antarctica. While most of us tend to picture field pumpkins–the round, orange variety we see so much around Halloween–there are hundreds of varieties of pumpkin. Colors range from grey, green, and purpley to the bright oranges, yellows, and reds. Some have stripes, some are speckled, and some are solid colored. The shapes can vary from long and crook-necked to those perfectly round ones you see. Little known fact: nearly every part of the pumpkin is edible–from the shell to the leaves and flowers. Most of us just like the soft orangey flesh in the middle thankyouverymuch, but the seeds (pepitas) and even pumpkin seed oil are really delicious treats worth trying. The early form of “pumpkin pie” in the U.S. was hollowed out pumpkins filled with honey, eggs, cream, and spices, covered with its lid and set in the fire to roast. The blackened pumpkin would be removed from the fire and the inside all scraped out to be a sort of pumpkin custard. Sure makes pie crust seem a lot easier, eh? The jack-o-lantern tradition started in the late 1800’s when Halloween became more of a community activity. British and Irish immigrants to the U.S. carried with them the tradition of carving faces into turnips, potatoes, and beets and applied it to the field pumpkins that proved so good for carving. Pumpkins are grown for size and weight competitions and there are even “sports” revolving around pumpkins. Yep. Pumpkin Chunking is a real thing. That beautiful orange color is a dead giveaway that pumpkins are FULL of great nutrients. Pumpkin, like most orange veggies, is loaded with vitamin A (which aids in eyesight and eye health) and beta carotein, a vitamin A building block that can help with anything from keeping your skin smooth to preventing cancer. They’re also pretty fiber-dense and low in calories, making them a great veggie addition for anyone looking to watch their figure or boost their health. Pumpkin seeds, in addititon to fiber, contain phytosterols. Phytosterols help reduce LDL (bad) cholesterol. They taste great plain, but are also easily added to granola and fruit crisp toppings. Pumpkin is rich in potassium. Cup for cup, it actually has more than bananas. It’s also a pretty good source of vitamin C, making it a good immune system booster. Season: Prime pumpkin season is late September to early November. Thankfully, canned pumpkin puree makes it available all year round, but if you’re going to try making something from scratch, now is the time! For cooking and baking: look for cheese pumpkins, baby bear pumpkins or sugar (sometimes called Sugar Pie or Pie Pumpkins) pumpkins. These will work best for things like pumpkin puree, pumpkin pie, and other cooking pursuits. For jack-o-lanterns and carving: field pumpkins make a great choice. How to choose one: Choose a pumpkin with very firm, uncracked skin that feels heavy for its size. Lighter pumpkins tend to be dried out and will rot faster (in the case of jack-o-lanterns) and won’t give as much flesh if you’re using them to cook or bake with. Pumpkins with more ridges have more seeds, as do pumpkins with rough skin. Pumpkins store best when they’re not placed on a hard, nonporous surface. They’ll keep better with a bit of air circulation, so a small piece of fabric, cardboard, wood, or straw underneath them will work wonders in helping them last longer. That holds true for carving and cooking! (That means if you’re keeping them on your counter or your porch or your tile floor, they’ll keep longer with something under them). Most pumpkins when kept in cool storage will keep up to 3 months uncut. Once they’ve been cut, they’ll start to decompose naturally, and more quickly. The smaller the pumpkin, the better the flavor. While the big pumpkins are definitely the most impressive, the smaller ones tend to be sweeter and more flavorful. There are 1.5 billion pumpkins grown in the U.S. every year. Illinois produces the most of any state. The Libby headquarters are in Morton, Illinois, and they can more than 85% of the world’s pumpkin. 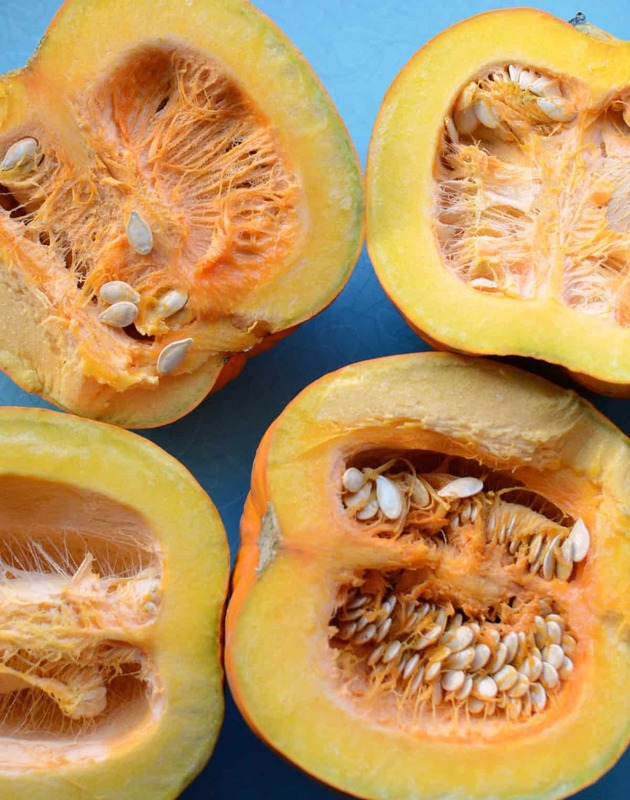 The average pumpkin has about 500 seeds inside. In 2009, there was a huge pumpkin shortage worldwide. 80% of the pumpkins in the US are available in October, and that huge crop was ruined by so much rain that harvesting was nearly impossible. Pumpkins used to be used for the original “bowl cut” haircut. Cut pumpkins were placed on one’s head and used as the template for cutting hair. They were also considered a “cure” for several conditions, from freckles to snake bites. Wasn’t that great! We drove 29.5 hours straight to my mom and dad’s on Friday and Saturday! The trip went as well as any trip across the country with four little kids could go. We are super glad to be here (and not in the car) and I can’t wait to share out trip with you. Thanks for stopping in!